Are you looking for an easy way to keep track of baseball stats? 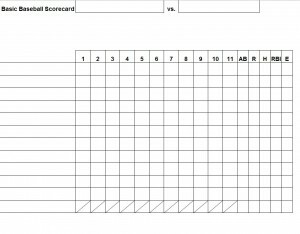 The baseball stat sheet is perfect for those looking to track the stats of games at any level of the sport. Whether it’s for a child’s Little League game or a day at a Major League ballpark, you can follow all the action with the baseball stat sheet from Microsoft. This basic baseball stat sheet is available on this page at no charge. To learn how to get it and how to use it, please continue reading below. Downloading the baseball stat sheet couldn’t be any easier. To get it, simply click on the link located on this page. The baseball stat sheet template will download within seconds. Once downloaded, save a copy of the file on your computer. If you forget to save it, don’t fret. You can return to this page and download the baseball stat sheet as many times as you need to for free! Filling out the baseball stat sheet is also incredibly easy as well. After downloading, you will notice that the baseball stat sheet comes in the form of a Microsoft Excel template. Everything on the sheet is customizable, so you can make any changes to it that you need to. The first step in filling it out is to add the competing teams at the top of the sheet. Next, you will see space for both lineups and rosters. Simply add each lineup to respective sheet until each is full. There is space to track the offensive stats for up to 11 innings. Because the sheet is customizable, this can also be expanded or decreased based on your needs. Never fail to track a minute of the action again with the baseball stat sheet from Microsoft. Download, save and print the complimentary baseball stat sheet right here today at MyExcelTemplates.com!